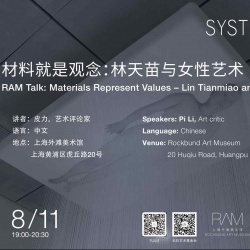 From 26th June to 26th August 2018, Rockbund Art Museum is very proud to present Systems, the first institutional solo exhibition in Shanghai by Lin Tianmiao, curated by Alexandra Munroe, Samsung Senior Curator, Asian Art and Senior Advisor, Global Arts, at the Solomon R. Guggenheim Museum, New York, with Xiaorui Zhu-Nowell, Assistant Curator, Solomon R. Guggenheim Museum, New York. The artist considers the exhibition to be a site-specific project exploring four key concepts: ‘individual consciousness’, ‘collective consciousness’, ‘public consciousness’, and ‘ultimate consciousness’. Each concept corresponds to a floor in the museum, from the second floor up to the sixth floor, as visitors embark on a sensorial journey of ‘consciousness’. The exhibition comprises a body of work representative of her practice over twenty years, together with several large-scale, interactive installations, which the artist has created recently in 2017, and have never been shown before to the public. Material of archival significance will also be exhibited at the same time. Since the early 1990s, as one of the first female Chinese artists tackling installation and video production, Lin Tianmiao has continuously explored various media throughout her practice. Using materials that evoke the traces and symbolism of feminine life such as cotton, thread, silk, fabric, and needles— she works on these materials by wrapping these everyday objects and covering them, thereby revealing her interest and reflection on everyday life and traditional handicrafts. With a unique imagination and perspective, she has proceeded to develop a distinctive, sensitive, and intricate deeply personal style. From early works such as Day-Dreamer, High !!! and Loss and Gain, visitors can become aware of the value the artist places on material and method, as well as an artistic practice filled with a tactile deftness and vitality. In 2017, after a twenty year practice, she made a break from the traditional media she became associated with, instead choosing to use glass—a man-made material widely used in modern life—in order to take on challenges never attempted before. 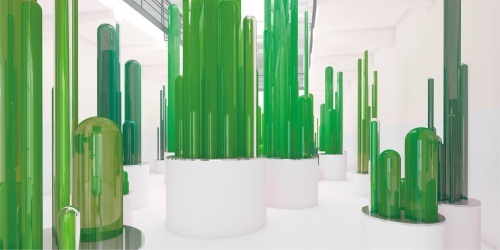 Lin Tianmiao began a collaboration with Shanghai Museum of Glass; starting from the initial stages of grasping the peculiarities of glass, to investigating artisanal techniques, and then dealing with scientific issues such as ‘mechanical motion’ as a way to experiment within her installations. She has sought to achieve a balance between art, science, and technology, by involving a richer and more multi-faceted method of exploration. Precisely due to these concurrent and frequent shifts in material, methodology, and visual language , visitors familiar with Lin Tianmiao’s work will gain a new perspective to experience her oeuvre. The catalogue designed and produced for this exhibition will be a continuation of the research in the exhibition, bringing together archival material, selected texts, and exhibition images. The texts will form an integral component of Lin Tianmiao’s solo exhibition Systems, which offer to the viewers a trajectory to engage with different readings derived from the exhibition. A series of public education events will also take place in conjunction with the exhibition to further explore different the themes related to Systems. 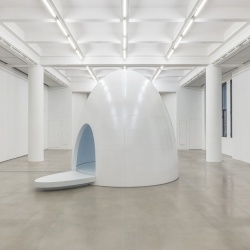 As the opening chapter of the exhibition, the second-floor exhibition space will display a new large-scale installation Reaction..Visitors will need to walk into the middle of the exhibition space to enter a white “enclosure” within a futuristic installation, where a series of intimate experiences and states of perception will begin. Audience’s are require to place their wrist onto the sensor for 5 to 10 seconds, which will gather the pulse rate, while blue fluorescent liquid drops down to a glass tube from beneath a spiral plate. Within a short time, viewers are able to see, sense, and hear their own ‘blood’ in motion. 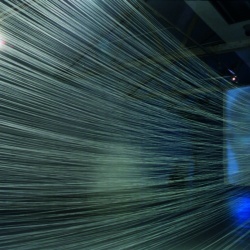 This exploration is also a one-to-one reaction between individual and machine, involving the authentic self and artificial self, where they encounter one another from within a set environment; this encounter transforms the process of gazing, perceiving, understanding, distinguishing and questioning the veracity of these forms of self-awareness. It strives to utilize the material reality of the self in order to accept its sub-consciousness. As a starting point, it uses the subjectivity of the audiences’ consciousness and then transforms the subconscious mind into an objective form of awareness. This objective form of awareness is then able to go back to different stages of the subconscious mind: simulation, reaction, examination, and mimicry. Separated by a single wall is Lin Tianmiao’s representative work Day-Dream. 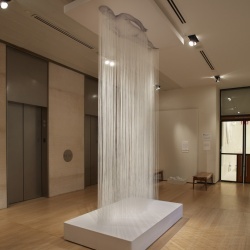 Created at the turn of the millennium, the work uses prominently white cotton thread, a cheap and ubiqitous material. 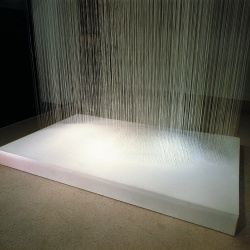 On the floor is a mattress hanging in the air with a canvas as big as the mattress above; the mattress and the canvas are connected by countless vertical strands of white cotton. The fabric on the surface of the mattress is pulled upwards, with a protruding shape as though escaping from space. 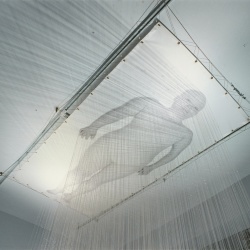 Under the illusion of lighting, the inter-woven cotton strands—faintly highlight a human figure—which constitutes as a deconstruction of the artist’s own image in an exploration of the formation of self-identity. The strong visual tension evokes also the incredible manual intensive labour involved in this large-scale production. The third-floor exhibition hall will present a new work, Warm Currents, a piece connected to collective consciousness, daily experiences, and modes of living. 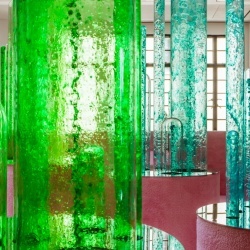 Using glass vessels of various shapes and sizes that recall the instruments found in laboratories, an utterly unique structure is produced. 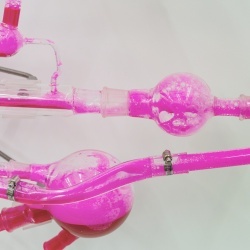 A pink fluorescent liquid that symbolizes the ‘circulation’ of life as it ‘revolves’ through processes propelled by the large apparatus of society, politics, and culture. The processes of ‘circulation’ and ‘revolution’ work in an antagonistic relationship, but they also remain mutually dependent to one another. The liquid embodies the vain struggle to break loose from the confines of a collective consciousness. Another important early work is the video installation High !! 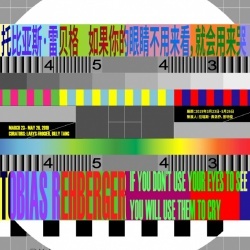 !..A screen broadcasts a moving-image. 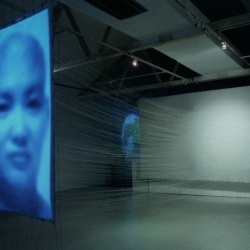 Nearly ten thousand cotton threads connect the screen with the canvas, while alternating continuously between high and low frequency vibrations, which are transmit between the cotton strands and the image - the image transforms from the profile of female in color into an androgynous image in black-and-white. While the video undergoes a transformation, the sound rises from a sonorous bass to a piercing high-pitch; the experience goes between the immense to a delicate sensitivity, which is modulated by the sound and image working together at once. The large-scale installation My Garden has been specially commissioned for this exhibition and will take up the entire fourth floor of the museum. 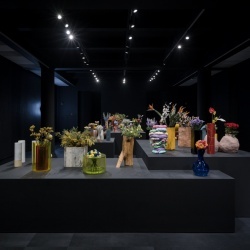 Borrowing from the concept of public consciousness—“making the real through artificiality, making the artificial through the real”—visitors are invited to take part in a “Greenhouse Garden” made of glass vessels. The audience is left with the sensation of being absorbed in a spectacular structure imbued with the art of natural gardening, science and technology, and daring artistic imagination. 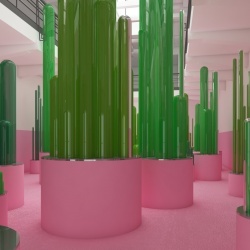 Here, the entire floor is covered by a soft pink carpet; within the pink bases stand different sizes of glass tubes that resemble a forrest of plants and from where different kinds of green transparent liquid is pumped around from inside. The audience will be able to read vernacular names given to plants such as ‘指甲花’ (Lawsonia inermis). 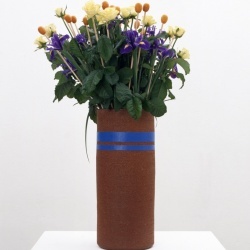 The point of interest for the artist is how these plants are retranslated back into English it becomes ‘nail dye flower’, which gives rise to the politics of a new kind of speech. 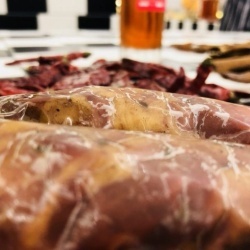 Moreover, for the artist, this process also embodies a kind of randomness and differentiation between the colloquial and an ‘international standard’. 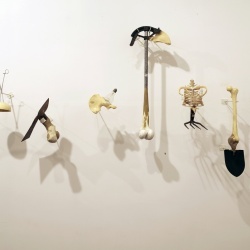 Loss and Gain on the fifth floor is another highlight of this exhibition: from individual, collective, public, to the ultimate consciousness, the artist has found a humorous way to join the commonalities between the human skeleton and everyday tools. 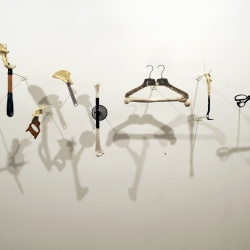 Each tool originally possseses their own specific function and attributes; when the tools and human bones are “conjoined” together, their functions and propertieis become reconfigured, thereby unexpectedly extending beyond the grave issue of death and allowing new cultural values to come into being. As visitors reach the sixth floor, to conclude the journey of “consciousness”, they will be able to view artist sketchbooks by Lin Tianmiao. Whether cross-section images, blueprints, or drawings each document is created with a meticulous attention to detail that recalls the production of an engineering blueprint, whilst also reflecting the chronological process of the artist’s creative thinking. Lin Tianmiao (b. 1961 in Taiyuan) now lives and works in Beijing, China. Lin Tianmiao studied in the Fine Art department of Capital Normal University, Beijing, in 1984, before then travelling to the US to live there in 1988. After graduating from the Art Students League in New York in 1989, she worked as a designer in New York for nearly seven years. In 1995, Lin Tianmiao returned to China from New York. Presenting The Temptation of St. Teresa, The Proliferation of Thread Winding, Pants, Trees, among others in an open studio, she thus laid out the important positions of her engagement in experimental art. It was also during this time, where she became known as one of the first Chinese female artists to gain international recognition. During the 1990s, when “apartment art” was a phenomenon in Beijing and Shanghai, Lin gained a great deal of experience. Lin’s early works are known for her practice of thread-binding where she binds the material—usually silk, hair, cotton, or felt—tightly around found or manufactured objects. Initially tasked by her mother to spool cotton as a young girl, Lin later reclaimed this act. 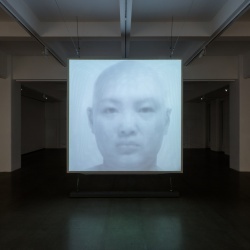 Lin’s work can be regarded as a study into her own social role and the relationship between identity and social context, exploring questions related to female identity. In 1998, Lin and Wang Gongxin created the Loft Media Center. She had been responsible for everything, from infrastructure and interior decoration, to the design, supervision, equipment management, and its organization, etc. This laid the foundation for the hosting of hundreds of cultural events in the future. In 2012, the Asia Society Museum in New York presented Bound Unbound, the artist’s first major solo museum exhibition in the US. Alexandra Munroe, PhD, Samsung Senior Curator, Asian Art, and Senior Advisor, Global Arts, Solomon R. Guggenheim Museum, is a pioneering authority on modern and contemporary Asian art and transnational art studies. 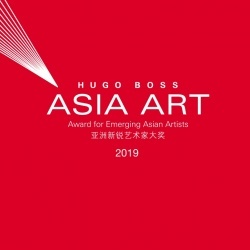 She has led the Guggenheim's Asian art program since its founding in 2006 while also working on the Guggenheim Abu Dhabi Museum and the Guggenheim UBS MAP Global Art Initiative. She convenes the museum’s biannual Asian Art Council, a curatorial think tank, and directs The Robert H.N. 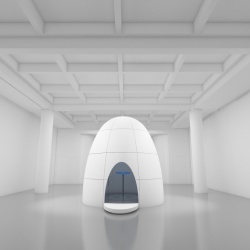 Ho Family Foundation initiative in contemporary Chinese art. 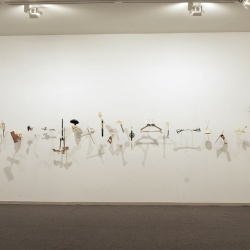 Munroe has organized many award winning and critically acclaimed exhibitions that have promoted international scholarship and recognition on modern and contemporary Asian art. She is recognized for launching the international critical appraisal of artists Cai Guo-Qiang, Daido Moriyama, Yayoi Kusama, Lee Ufan, Mu Xin, and Yoko Ono, among others, and for bringing such historic avant-garde movements as Gutai, Mono-ha, Korean Tanseakwa and most recently, Chinese conceptual art, to international attention. Raised in Japan, Munroe was former Vice President of Japan Society, New York, and former director of its museum. She holds an MA from the Institute of Fine Arts, New York University, and a PhD in History from New York University. She serves on the advisory boards of Rockbund Art Museum, Shanghai and is a trustee of the Institute of Fine Arts, New York University. She is a member of the Council on Foreign Relations, New York.